The team – led by RecchiEngineering and composed of LAND Milano s.r.l., PICCO Architetti, + Studio Architetti Associati e Immagine e Territorio di Livio Dezzani – won first prize in the international competition of ideas launched by Torino Nuova Economia, for the re-use of the former Mirafiori industrial areas in Turin. The project is of strategic importance for Turin and aims to transform the disused Fiat Mirafiori industrial plant into a new pole of attraction and aggregation. It involves an area of some 140,000 sq. m. and envisages the re-use of two existing buildings – the former DAI building and the former Tyre warehouse – and the redevelopment of two free areas. 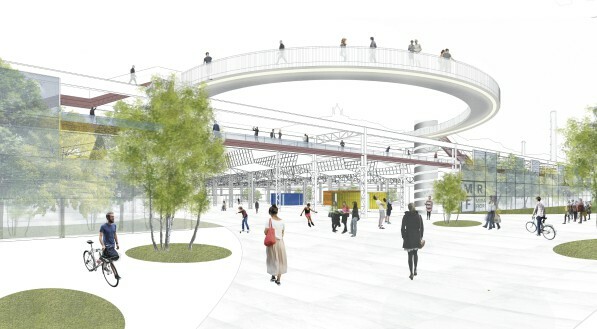 The project is part of a broader programme to define the city’s new “South Gate” (“Porta Sud”). This will be one end of the new Line 2 of the Metro. The competition placed great importance on the economic viability of the project, and its ability to integrate very closely with the economic and financial dimension in order to attract resources and foster development. The award ceremony was held on Friday 3 July 2015 in the former DAI warehouse, one of the buildings to which the competition referred. The ceremony was attended by the architect Cino Zucchi, Chairman of the panel of judges, Antonella Parigi, Piedmont’s Regional Councillor for Culture, and Stefano Lo Russo, Turin’s Councillor for City Planning. They awarded prizes to the eight finalists selected from among the 48 projects submitted. According to the panel of judges, the winning project was the one that best interprets and integrates the functions set out in the competition. It is innovative and reinterprets the area’s industrial past in a contemporary key and without distorting it. They jury found the layout convincing: a fluid landscape that incorporates and reinterprets the rigid structural grid, establishing a totally new relationship with the city and creating new spaces for temporary functions. The project’s functional mix and economic viability were deemed convincing and feasible: no land take, renewal and upgrading of disused industrial areas with an interesting functional mix for the city as a Whole. The project examined the large spaces of the former DAI and Tyre warehouses, in search of a new identity. Their functional and morphological features have been re-designed. An urban landscape, which becomes the mainstay of the plan and of the definition of a new relationship between inside and out. A large covered, poly-functional and versatile square, used for sports and leisure activities, and for social events, is the area’s new pulsating heart. An urban nursery and a large open space with urban gardens and areas for temporary events for a new urban experience. “Start-up bubbles” and creative labs to re-interpret the area’s industrial past. These are the themes proposed and interpreted in a fluid design of the spaces perceived in contrast to the rigid industrial grid structure. Temporary events are seen as the driver of regeneration and development of the area, through an incremental process of construction. In this context, temporariness is intended as the definition of a versatile, organised space, capable of adapting to different types of use, different social behaviours and changing economic conditions.